I have been relying mostly on the Basenotes database to determine when scents were launched, and I've been trusting them more than my own memory, but I am not sure I believe the listings for 1988, because they have twenty-seven Maitre Parfumeur et Gantier scents, nearly the entire line, having been released in that year, and that hardly seems possible. The line was created in 1988, but did Jean Laporte really fling nearly thirty scents into the marketplace all at once? There were not quite so many releases each year in the 1980s; nothing I couldn't have kept up with if I'd put my mind to it. But I had something else to worry about, and that was another nose in the house. Jim and I moved in together within a month of meeting, which of course is a terrible idea, usually, but it made perfect sense for us; although I was, believe it or not, paying only $125 a month in rent, Jim considered it--and still calls it to this day--a rathole (a third-floor walkup with a makeshift shower, a barely functioning toilet, and no lock on the front door, which I shared with a couple who were on the verge of disintegrating), and he couldn't get me out quickly enough. Jim, unfortunately, had then and has to this day a distaste for commercial scents. For anything scented. He'd gladly forfeit his sense of smell if it meant he wouldn't have to put up with another overperfumed co-worker in the elevator, another barrage of fragrance when walking into a department store. When I moved in with him, I brought with me not only my collection, but my desire to keep collecting. It took me a while to understand that scents were anathema to him, of course, because I am very slow on the uptake when it comes to other people's inner lives, but I soon figured out some workarounds: only go to the fragrance counter when I'm alone, don't wear things he hates (e.g. most of them) when he's around, carry sample vials so I can apply them before getting to work. We both make our compromises and we get along somehow, and that is how marriage works. At this point it's hard not to feel like I'm beating a dead horse, but here it comes again: mass-market scents in the eighties, or at least the ones that I wore, were better than anything you can find today: fuller, richer, more complex, more interesting, more challenging. Knowing is the perfect case in point. Though I had discovered other chypres (Diva, Parfum Rare, even the Body Shop oil called Chypre), to the best of my recollection Knowing was the first scent that I put the name "chypre" to as a commercial scent, probably because it got a lot of ink; never let it be said that Estee Lauder slacks off when it comes to promoting their products. 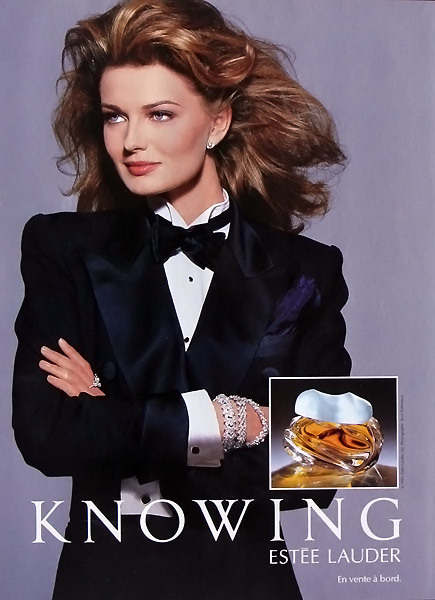 Because there was so much written about it at the time, and because it roped me in so handily, Knowing, to the best of my knowledge, was the first scent that got me really, seriously thinking about scent. It's still in production, but of course it has been reformulated, and the re-do is very much a modern affair: brittle top notes, an immediate deluge of patchouli (the calling card of the "modern chypre"), an indifferent bouquet of flowers, no subtlety, no charm, no elegance. There is oakmoss, not remotely as much as there ought to be, but at least it's in there. If you smelled the two side by side (as I have), you would never think that they were versions of the same scent. If someone told you that they were, you would be shocked and disappointed that they had taken something so utterly redolent of genius and reconstructed it into that. It's as if they'd taken the Mona Lisa and run it through Photoshop software that reworked it in the style of Jeff Koons--and worse, destroyed the original and convinced everyone that that's what it had always been like (we have always been at war with Eastasia). If you should ever chance upon some vintage Knowing, buy it. You must have it. (If you hate it, I'll buy it from you.) I've smelled a lot of chypres in my time--not enough vintage, for sure, but at least I was operating in a time when they were still being produced--and Knowing is one of the greats. If you have a negative opinion of Lauder scents, if you think they're too big, too bandwagony, too American, be prepared to reconsider. I don't think too much of Lauder's output in the recent years--the last really excellent thing they produced was Spellbound, back in 1991. though there have been some decent ones since then--but there were some classics through the years, as good as anything from France or Italy, and Knowing is one of them. Now. What else came out in 1988 that enthralled me at the time? On the men's side of the aisle, not much. Of course, everyone was wearing Sung Homme, which was a guaranteed success after the sheer ubiquity of the first Alfred Sung scent a year earlier: I didn't pay much attention to it at the time, because women's scents were often much more interesting and because I was already developing a taste for the slightly out-of-mainstream scent: I didn't want to smell like everyone else. (I eventually did start wearing it, though, and still rather like it.) I also avoided the unavoidable Cool Water, Fendi Uomo and Jazz by Yves Saint Laurent; in fact, they made so little impression on me that I couldn't even tell you what they smelled like. I did, however, wear the offbeat Fahrenheit, like most every other man at the time. The scent itself was not exactly me, although I owned it and wore it from time to time, but the shower gel--well, that was perfect, a cloud of that strange, angular floral-aromatic scent that dissipated to leave a trace of woody patchouli on the skin. I also enjoyed Benetton Colors Uomo more than I probably should have, partly because I had been so fond of the women's version the year before and also because I liked the pentagonal-prism bottle. The scent itself wasn't really anything special, but its bright, masculine simplicity was an occasional pleasure. I liked the odd, pepperminty New West Skinscent for Him, but something about it put me off, and I think that something might actually have been the name: they were so afraid of scaring off a customer by calling their product "cologne" or "eau de toilette" that they made up the name "skinscent", which is the same thing only pretentious. I don't know what it smells like these days, but the very first Kenzo scent, in that bizarre flower-growing-from-a-stack-of-pebbles bottle, amazed and thrilled me in 1988. It was more or less a straight-up floral, but it was wildly complex, and what's more, it had a way of changing perpetually throughout its life: rather than having three acts as most classically constructed scents do, it was as amorphous and undulating as a Lava Lite. A flicker of coconut, a blaze of carnation, a fragment of wood; it seemed to contain everything possible, and it was ungodly beautiful. Boucheron, the first scent from the jewellery house, was colossal. Huge. Almost unimaginably elephantine. Big fat orange-blossom top, big fat tuberose middle, big fat oriental base. There was so much of it. You'd think that the powerhouse eighties weren't almost over, that the era of huge perfumes wasn't about to come to an end. Eternity put the first nail in that coffin, though. Fragrances didn't suddenly become quiet demure little things, of course: cultural shifts like that take a while to percolate through society (Obsession kept selling, and still sells), and scents that had been in the pipeline for a while were still going to be released. But after years of massive, sinus-clogging perfumes, there was a change in the air, and Eternity was at the vanguard: a gauzy, innocent white floral with a freesia core. It's hard to say whether Calvin Klein and his marketing people sensed a change coming, or bullied everyone into changing with their relentless onslaught of advertising: some of both, probably. But either way, things were not going to be the same. I just purchased a bottle of vintage Colors, to take be back. It was my signature scent for a few years there! I thought you might enjoy knowing that when I added your feed, Google Reader suggested that based on your blog I may enjoy reading about The White House and The President of the US. A clear link. You know, if I were forced to choose, truly forced, I would of course elect to hear the words "we both make our compromises and we get along somehow...the marriage works." Big picture, it is the most important. You are on, as far as the "get it" with the old Knowing goes. Eyes are now open. Same eyes are also looking for a bottle of KL. If you find one that isn't ridiculously high in price, I'll buy that if you don't want it.